I enjoy collecting old photos of Phoenix, and was very surprised to see how many trees it used to have. In some of the old photos, Phoenix is a veritable forest! But my attitude isn't sadness, it's hopefulness. I don't wish that things could "just go back to the way they were" as that is too hopeless for someone like me. And I realize that my vision seems impossible, which is for Phoenix to be a city of trees again. Looking north on Central Avenue at Monroe in 1919, at the forest of trees of Phoenix, Arizona. I post photos of old-time Phoenix on the internet, and I notice that even the most, uh, mature people can't possibly be old enough to remember when Phoenix was a city of trees. The best I've seen is people who remember the big cottonwoods along the canals, or the rows of citrus trees. And I really can't blame them, they're just too young! My vision isn't just a row of trees along a canal, or along a road. I'm seeing a whole city of trees. And since Phoenix is mostly homes, I see those trees planted in every plot of land possible, not just public places. I see a Phoenix the way it was in territorial times when every house had so many trees around it you could hardly see the house. I've been asking people to plant a tree, and care for it. And somehow so many people miss the point, and just go write a letter to some government official. Or they get into an argument as to what tree should, or shouldn't be planted. I've even heard people scoff at "parking lot trees" like acacia, or palo verdes. And in the meantime I've seen the city I love sit under the burning sun with precious few trees. So I'll try again: please consider planting a tree, and caring for it. This is the desert, just putting a tree in the ground and not caring for it won't work. And yes, any tree - big shade trees, small desert trees, palm trees, anything. If you don't know where to start, I'd suggest where I started, by learning about xeriscape at places like the Glendale Main Library. Or I suppose nowadays you could just Google "xeriscape". Yes, I know that I'm being unreasonably optimistic, but that's what the people who founded Phoenix were. They imagined an oasis in the desert, a place that was inviting to people, and animals, and it included trees. 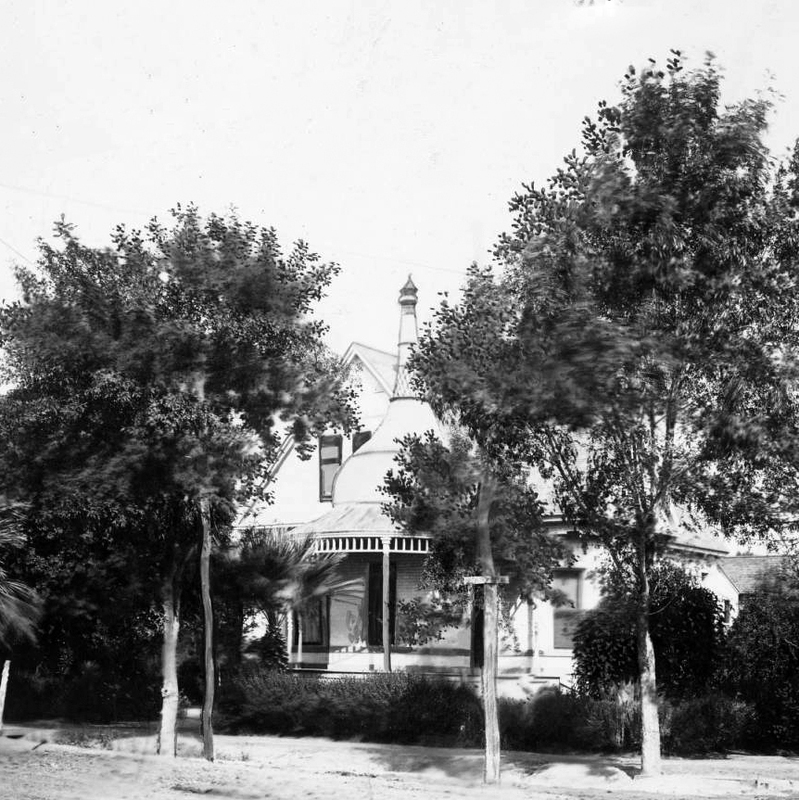 Image at the top of this post: The Evans House in 1904, 11th Avenue and Washington, Phoenix, Arizona, surrounded by trees.